Bright Gold finish Sanctuary Lamp, base 7" and height 6 _". This beautiful Bright Gold finish Sanctuary Lamp stand measures 7" in base and 6 ½" height with 4" x 12" crackled glass cylinder not included. 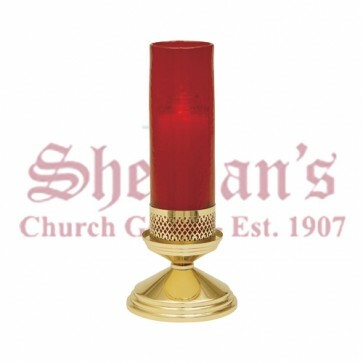 Simple yet elegant design will make an great addition to a church sanctuary. Crackled Glass Cylinder available at additional cost.